A great event happened for the upcoming return of Toothless and his master Hiccup. 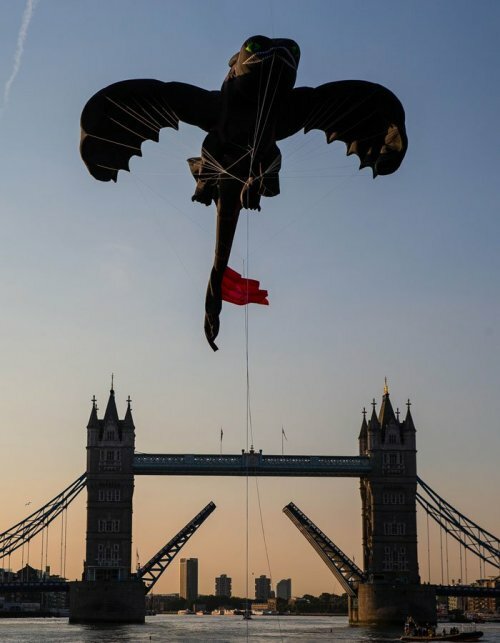 A huge Toothless kite was flown down the Thames and under the iconic Tower Bride. A wonderful way to use both the idea of flying dragons and one of the most iconic bridges in the world. This all happened first thing this morning [6am, July 1, 2014] when the bridge raised up to welcome the dragon into London. You can see footage from this event below as well as more from the upcoming How to Train your Dragon 2. The second part of the trilogy. London as seen quite a few large scale events for films but I do think that this looked like one of the most spectacular. The only other one I can think of that could come close is when Spiderpig was flown over the Battersea Power Station in homage to Pink Floyd’s album, animals. That one was for The Simpsons Movie. We were also sent an image from the event. Taken just after Toothless had made his pass through the bridge. It is quite stunning. The kite was 54ft from head to toe with a wingspan of 36ft (bigger than a London Double Decker bus) and expertly flown by six trained kite flyers after months of planning.